As Week 11 and 12 wrapped up, I am officially half-way through the UT BOOTCAMP. Wow. I can definitely see the growth in my skills and knowledge level. The past two weeks were all about Node.js and MySql. Homework assignments for these two weeks were completed in the terminal and are demonstrated here using tutorial videos. We got a lot to cover, so let's get to learning and discovering. As such Node.js and Chrome share the engine but have different runtime environments. Since Node.js is cross-platform it can be run on OSX, Microsoft Windows, and Linux (which is a huge plus). Asynchronous or non-blocking, meaning that the server doesn't wait for an API to return data before moving on to the next piece of code. Once the API call has finished and is returned, Node.js will then handle it. This means it uses a single thread model with event looping to handle requests. Also because the single-threaded model is non-blocking and can handle many requests at the same time, it makes this platform very scalable opposed to other servers like Apache that create multiple threads to handle requests. The image below captures how Node handles events. Node.js apps don't buffer any data, they just return them in managable data pieces. Another great resource for learning Node aside from the documentation mentioned above is here. One fun fact: Node's package ecosystem is one of the largest open source libraries in the world. MySql is an open source relational database built on the SQL architecture. It allows for the storage and retrieval of data. Think of it as a warehouse that stores all of your merchandise and you can send merchandise to your warehouse or retrieve it and send it somewhere else. Additionally, here is a great list of shortcut commands for SQL. Let's see Node.js in action. This hangman takes on the basic hangman rules (similar to the previous hangman I created) except this one cannot be played online, it can only be run on a local terminal. Now that you have seen how it functions, how was it built? The framework is built in Node.js and I have also used a few npm packages to achieve the look and feel. I have used the npm package Colors which allows the user to call simple .colorName functions to change the color scheme on your screen. My favorite is .rainbow which is used in the category description. To make the terminal interface more user-friendly the npm package Inquirer was used. 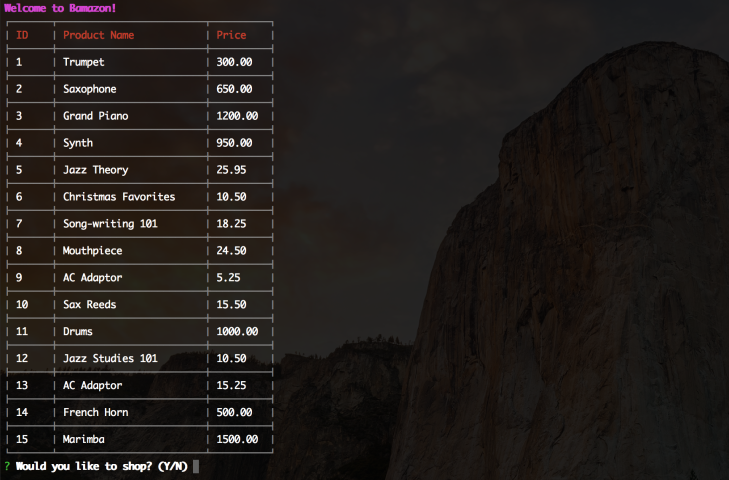 This project displays a table of items that are available to the user to purchase. To build this, the framework used is Node.js and I used the Inquirer npm package again. The main difference here is that I used MySql to handle all of the data. The data that is displayed in the terminal is housed as a table in the database and every time the user purchases an item it decreases the available amount to purchase in the database. Additionally, to prettify the table output I used the Cli-Table npm package. Until next time... smile and be strong! !